Thousands of demonstrators marched peacefully through Paris – their 19th straight weekend of protests – ending up at the Sacre-Coeur Cathedral overlooking the city from the historic Montmartre neighborhood. A police officer on the plaza suffered a heart problem, slumping to the ground before being hospitalized in what Paris police described as a “very serious” condition. Associated Press journalists at the scene saw no violence or incidents nearby when he collapsed. Overall though, Saturday’s protests were calmer than a week ago, when resurgent violence reminded France’s government that they’ve failed to quell yellow vest anger. Luxury shops were looted and ransacked last weekend around the Champs-Elysees Avenue in Paris and some were set on fire by protesters. This week, Interior Minister Christophe Castaner estimated that 40,500 people took part in protests around France, up from 32,300 a week ago. This week’s protests were more spread out, with just 5,000 estimated in Paris compared to 10,000 last Saturday. “Since when do soldiers face a population? We are here in France. You would say that we are here in (North) Korea or in China. I never saw something like this,” said Christelle Camus, a protester from a southern suburb of Paris. Polls suggest last week’s violence dampened public support for the yellow vests – but that a majority of French people still agree with the protesters’ anger over France’s tax system and Macron’s leadership. Saturday’s marchers held signs demanding more say for citizens in public policy. 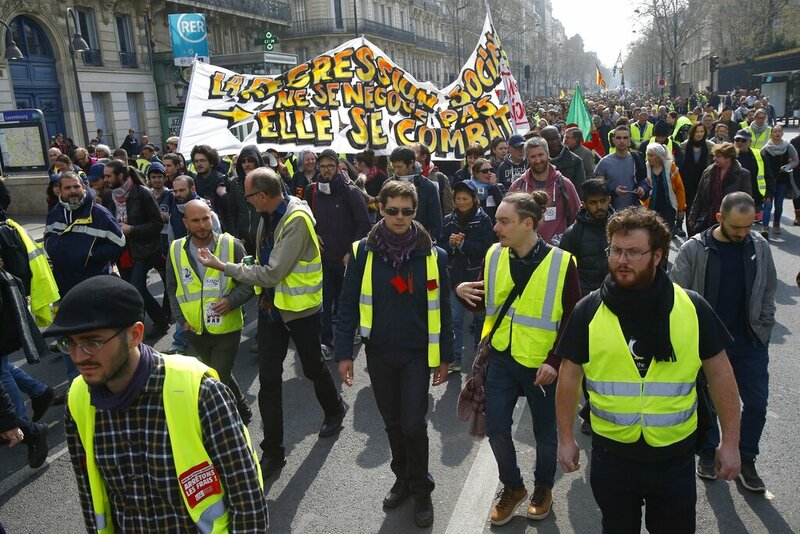 The protests started in November to oppose fuel tax hikes but have expanded into a broader rejection of Macron’s economic policies, which protesters say favor businesses and the wealthy over ordinary French workers. Macron countered by dropping the fuel tax hike and holding months of discussions with the public on France’s stagnant wages, high taxes and high unemployment. Pyongyang challenge: Should US shoot Kim’s missiles down?